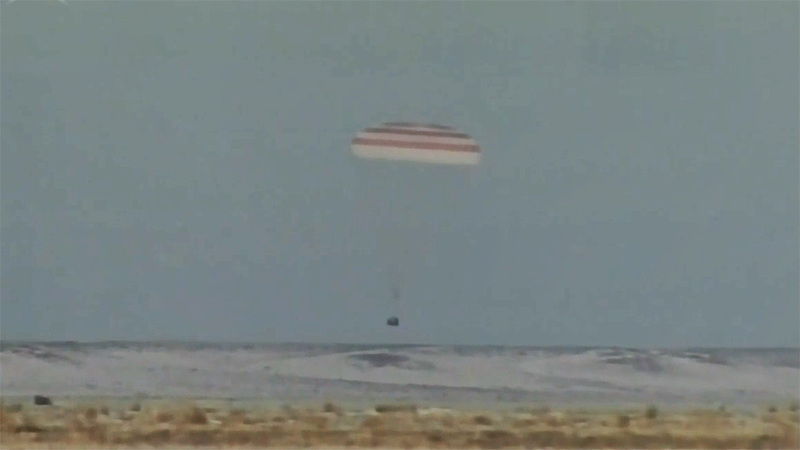 Three crew members who have been living and working aboard the International Space Station have landed in Kazakhstan. Expedition 53 Commander Randy Bresnik of NASA and Flight Engineers Paolo Nespoli of ESA (European Space Agency) and Sergey Ryazanskiy of Roscosmos landed at 3:37 a.m. EST (2:37 p.m. Kazakhstan time) southeast of the remote town of Dzhezkazgan in Kazakhstan. It is a frigid 10 degrees Fahrenheit on the ground, with the wind chill making it feel like 5 degrees below zero. Together, the Expedition 53 crew members contributed to hundreds of experiments in biology, biotechnology, as well as Earth and other physical sciences aboard the orbiting laboratory. Their time aboard marked the first long-term increase in crew size on the U.S. segment of the International Space Station from three to four, allowing NASA to maximize time dedicated to research on the station. During his time aboard the orbital complex, Bresnik ventured outside the space station for three spacewalks. Along with NASA astronauts Mark Vande Hei and Joe Acaba, Bresnik lead a trio of spacewalks to replace one of two latching end effectors on the station’s robotic arm, Canadarm2. They also lubricated the newly replaced Canadarm2 end effector and replaced cameras on the left side of the station’s truss and the right side of the station’s U.S. Destiny laboratory. Ryazanskiy conducted one spacewalk with fellow cosmonaut Fyodor Yurchikhin in August to deploy several nanosatellites, collect research samples and perform structural maintenance. Bresnik now has spent 150 days in space on two flights. Ryazanskiy now has 306 days in space on two flights. Nespoli has logged 313 days in space on his three flights. The Expedition 54 crew continues operating the station, with Alexander Misurkin of Roscosmos in command. Along with crewmates Mark Vende Hei and Joe Acaba of NASA, the three-person crew will operate the station until the arrival of three new crew members on Tuesday, Dec. 19. Scott Tingle of NASA, Anton Shkaplerov of Roscosmos and Norishige Kanai of the Japan Aerospace Exploration Agency (JAXA), are scheduled to launch Sunday, Dec. 17 from Baikonur, Kazakhstan. NASA Television will broadcast the launch and docking. Others make it look simple while the rest are still dreaming!